If you arrived from my friend Julia's blog you are on the right track! Welcome to the last stop on the hop! Every time we release new stencils at StencilGirl, I get fascinated watching them go from drawings to the actual product. These by Traci Bautista are no different. Hummm...what to make??? How about I just play with them and see what happens??? I started with some Gelli Prints. I used a variety of Traci's new designs to make these. Now I have some papers to use in my Art Journaling and DLP. Then I moved on to some other Gelli Prints in a different color palette. These, although not screaming the stencil were some of my favorites. I used the 2 Gelli Prints as a background on the two pages of my DLP. I didn't add any of the tip in's from the beginning and add them each way in a way that works for me. After I had the paper down, I used a scissors to cut thin wavy lines with the bag paper to separate my days of the week. I then used some number stamps I carved to put the dates in. At the top of the page I used Traci's Circle Circle stencil. Here is what the spread looked like with the flap closed before I started my week. The challenge for this week was to add a tiny photo. The "Be Free" on the flap is Traci's Be Free stencil. Here is with the flap open. I used Traci's Flower Party and Circle Circle to get some color down. Now I'm all ready to add my journaling and other embellishments for the week. Before you go, make sure you comment to win the GIVEAWAY on StencilGirl Talk. We will pick TWO lucky winners! Each one will get a complete set of Traci's 5 new designs! Leave a comment here and the other blogs on the hop. The more comments blogs you comment on, the more chances you have to WIN! Comments close Sunday, July 27th at 11:59PM Central Time. The stencils look like lots of fun....I would love to play with them! Maria, OK I'm definitely taking my Gelli plate out for a spin later this week! LOVE the papers! Loving all your colors and layers and DLP!! Thank you, Maria, for this inspiring artwork -- you're a wiz with the Gelli Plate, and I love your color combinations! I haven't started a DLP yet, and I say yet because every time I see yours I am so so so so so so so tempted to start one! Did I mention I love this and am feeling tempted? Love how you used the Circle Circle stencil. Beautiful! Thank you for sharing - I spent some time looking around your blog while I was here as well - great ideas!!! I LOVE your DLP ~ it is so inspiring every time I see it! Can I add one more project to my list??? You used this stencils in such a clever way with your pages ~ love it! So many ideas the this hop. Love them all. The stencil are beautiful!! I love your creation!!! I love that you went to town with a whole boatload of colors. And the design lets them all work!!! Thanks for sharing! What great results; I love the colour combo as well as the stencil! One word - fabulous - covers your design and these stencils. I am in love! WOW! You inspire me! You are so adventurous! You have such a knack for warm, rich colors. Thanks for sharing! I really want to win these stencils, too...Put in a good word for me! Thanks, Maria! Love your gelli prints! You got such awesome layers. And I love seeing you use it in your DLP... I'm already behind on mine, but you're giving me great inspiration to get going again! Thanks! I am going to try gelli prints and am dying to get the gelli plate!! Awesome! 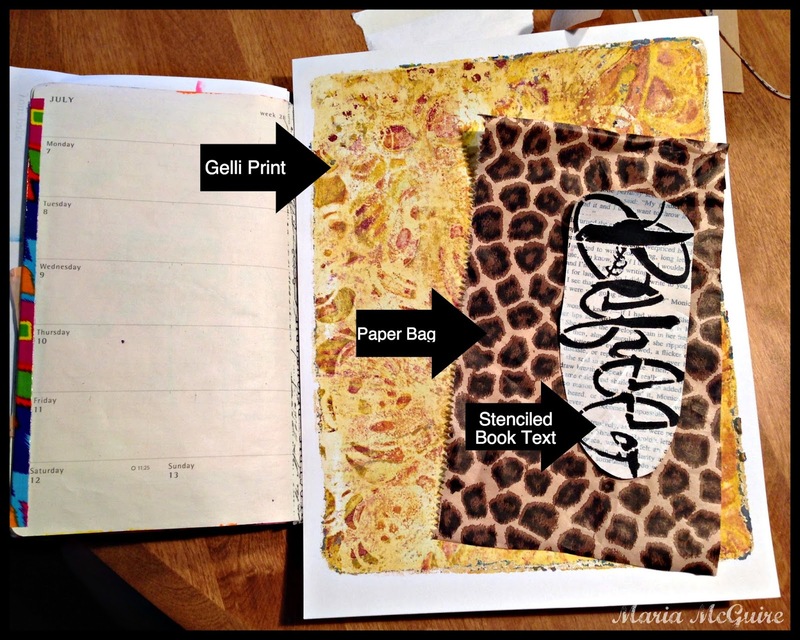 I really love how you used Traci's stencil in your DLP planner! Fabulous page spread starring traci's new stencils! You put them to great use on your DLP. I love the gelli prints you made, Maria, including (and maybe even more so) the more muted pages. I can't wait to get Traci's stencils to make some gelli prints to use in my art journal! Lots of great ideas... thanks for sharing. Love the subtlety and complexity of your designs. Traci's stencils are obviously VERY versatile. I'd love to get my hands on a set. Thanks for sharing such great ideas! I love how you did your day planner...I may have to steal....no "borrow" your ideas! 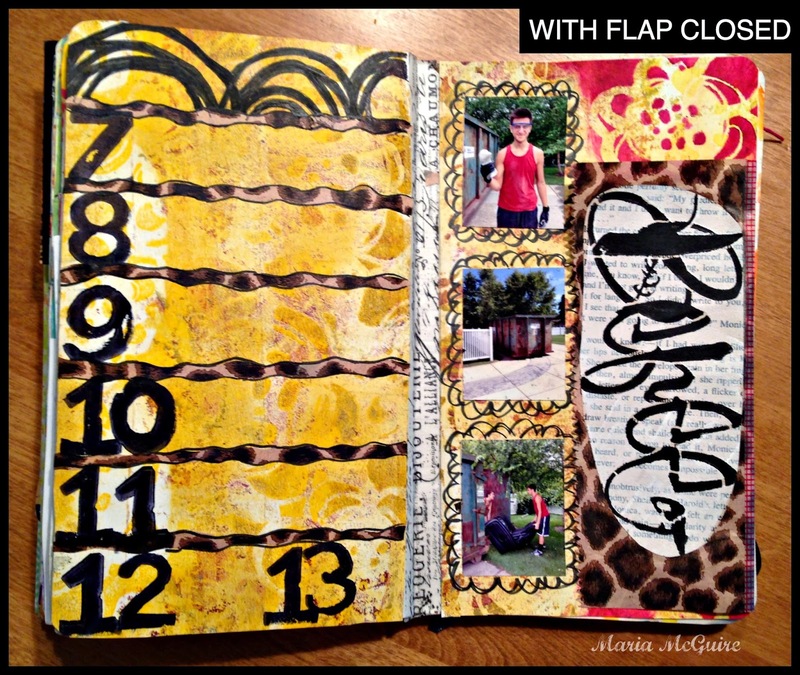 Fabulous - I love the flap !! Perfect for the DLP. I love all your color experimentation, too! I just got a gelli plate and am inspired!!! Now I just need stencils! I love little interactive features in journals and how you've used the stencils here on the flap. Subtle is good with a stencil - makes it your own. Of course these stencils are calling for gelli printing, but your marker drawings are looking great as well! Love how you've used Traci's stencil for your DLP! I really like the muted background! Thanks for the tutorial! Fabulous creation, love the tutorial! I never would have thought to use the circles as a border! Thanks for the inspiration. Very creative designs using the stencils! 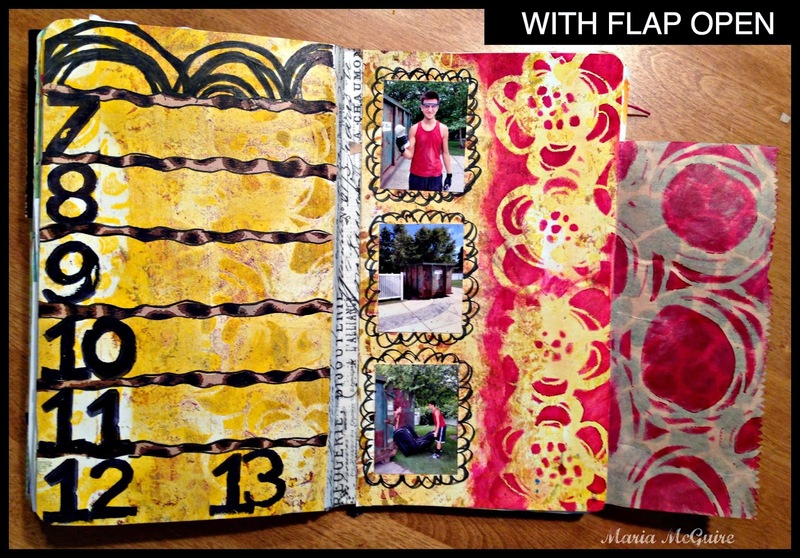 I loved the interactive pieces to your art journal and how bright the colors popped! Love what you did with the pieces Maria! After visiting all the blogs, I can see so many possibilities with Traci's designs. What a great match - Traci and SG! Thank you for the chance to win! I just love seeing all the different ways these stencils have been used! Such wonderful backgrounds! Thank you for the inspiratioN!! You are so very creative! I love these fabulous stencils! Thanks so much for the opportunity to win! Blogs are so inspirational. Love the colors you used. Maria, these are the most flexible stencil designs! I liked your colors, esp the gold/burgundy(?). I don't do DLP but I liked your pages. Gelli plates are great! 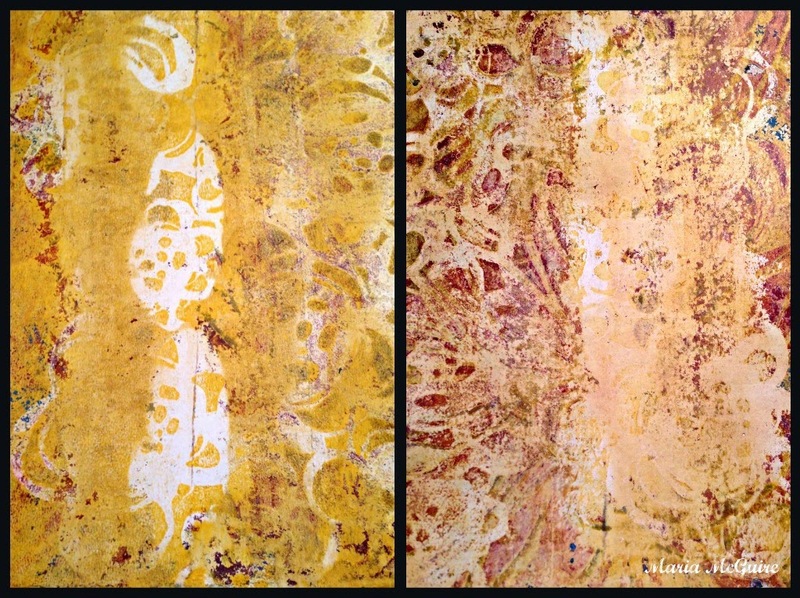 The color combinations of your Gelliprints are wonderful....fantastic stencils too! Wow! Love your work!!! I am loving these stencils! I am a floral stencil girl! 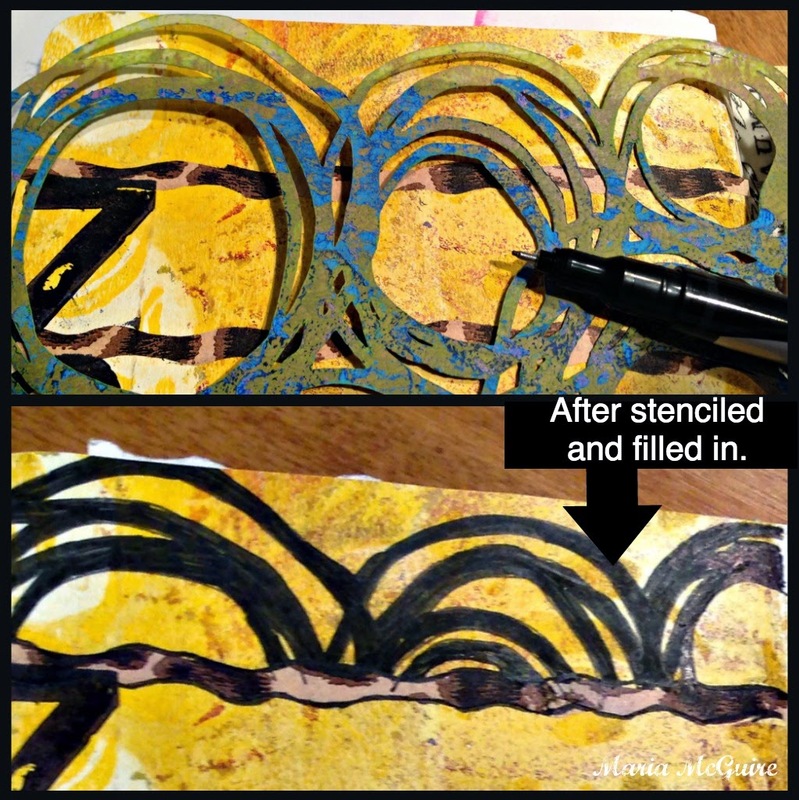 I love gelli prints and I love these stencils! These stencils are really versatile. I love the project you made. Such fun for an interactive journal page. Thanks for sharing. Wow, I knew you would have some amazing art to show us with Traci's fantastic stencils. I don't even know which one I like the best because they are all so creative. I hope I get to play with them soon, too! Thanks. I like your DLP page! The DLP is so fun to do isn't it. But I really love the first ones you did they remind me of batik material! The colors are amazing! Maria, using these stencils with my geli plate is exactly the first thing I thought of! Great tools to make homemade paper! Thanks for the idea and the chance to win these. I loved the hop, I learned so many techniques! Really beautiful pages, Maria. I can't wait to get my hands on the rest of the Traci collection. Love every one of them! I really like your idea to use a paperbag. Craft paper is so amazing with paint. I like the tip in as well. I need to start doing that in my art journal. Thanks for the chance to win. Love your DLP beautiful! Can't wait to get some for myself to play with. Scrummy!!! Love what u have created with those gorgeous stencils!!! Lots of fun here with great stencils. Wonderful pages Maria! i do like that second section where the colors are a bit more subdued! Great work with Traci's new stencils! DLP...now I'm intrigued. the stencil looks great blacked in. Great journal page. Lovin' these stencils, very fun!!! I want to play! Wow this is amazing! Great use of stencils. Love the colors and creativity!! Love the new stencils and your art is so inspiring. Love your DLP and the way you incorporated the new stencils! Beautiful! I don't think I can wait to see if I win these. I need them now!!! Love how you incorporated the stencils into your DLP! awesome stencils!love them-They are so fun! This blog hop has been sooo worth it. I have enjoyed all the artists work with Traci's stencils. I couldn't pick just one. Loved seeing what you did with Tracy stencils, Maria! I always enjoy your use of bright colors and fun, creative style! Wow! Love this! May consider the DLP at some point! Thanks! What a great use of the papers you created with this awesome stencil. Very exciting. Wow! Looks like you had fun with these stencils. Love how you incorporated one into your journal. Unique way of using the stencils. Really really like your layout! Thanks for a chance to win these great stencils! Stencils, stencils, stencils...don't you just love them. LoVe how you've used Traci's stencils and the gelli prints! This looks like so much fun! I love the way you used the stencils for gelli prints! How exciting to have a chance to win! Thanks! I can't wait to use these stencils with the gelli plate - they just seem like they were made for each other. And I love your DLP planner, which I am not doing, but am thinking I will next year. 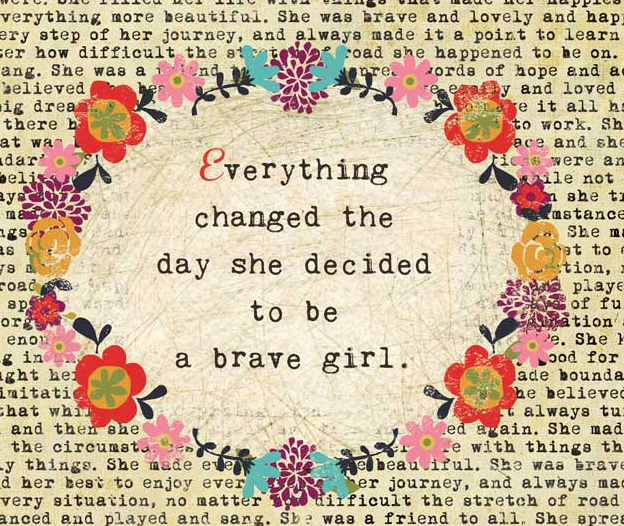 Thanks for the inspiration, Maria - beautiful work!! Your DLP pages are sweeeet! Love the way you used the stencil and I seriously need to use my Gellie plate! I must use my Gelli plate more often.. love the look from the stencils you used.... I must have these stencils, your colors are so vibrant! Amazing. The colors are like Joseph's coat of many colors. So many ideas and tip on this blog hop. this is so pretty. I really like how you used this stencil to create something very unique. Love the little strips of paper to separate your days! I hope it's okay if i copy the idea! Traci's stencils are awesome. Great use of the stencils! I'd love a chance to win! I liked the more subtle color combos. You used your papers in an interesting way. You became creative twice. Once when you made the prints and once when you used them to make your pages. 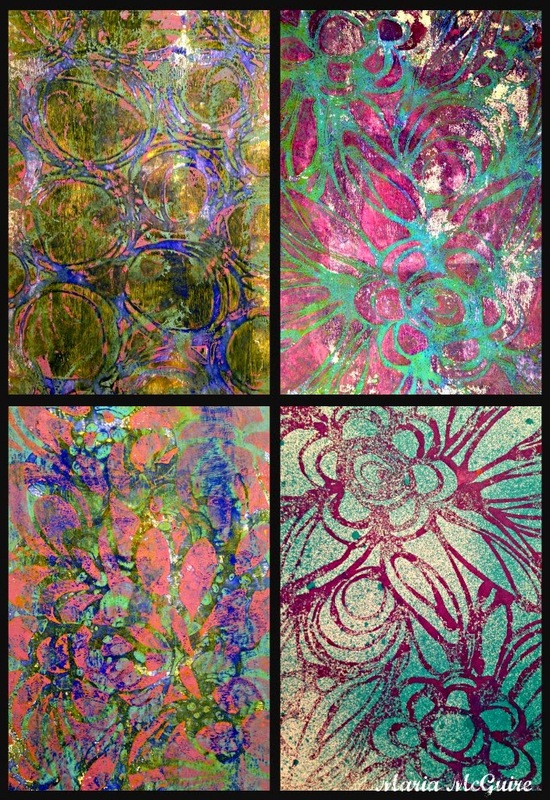 Love the gelli prints you made! Great way to incorporate stencils into your DLP calendar! The new designs by Traci are great and look fun to use! Great colors, super tip ins. Would love to play with these stencils and my gelli plate. I particularly like your pink and green prints. Your prints with these stencils are amazing! I love the color combinations. The prints you used in your DLP pages are toned down, but very striking. Thanks for sharing your talent and creativity. Traci's stencils are great...very versatile, very cool. They are definitely on my wish list! Maria, such beautiful work! Thank you so much for sharing with us all. I have started making my DLP diary and love your approach to it. Like you, I like the images where you have used the stencil and made them really your own. Very cool! I love how you used the stencils! It is really fantastic! what a great use of the stencils! love how they are incorporated into DLP pages uniquely. Thank you for the opportunity to win some!! Great use of stencils. I especially like the circles. Luv your project and luv these stencils!!! would be ever so grateful for stencils for my D L P ... I APPRECIATE the example you shared of the tip out/flip out. ----> circles are SO therapeutic too. Love what you've done with these stencils...can't wait to get some too! Will have to try your gelli plate idea. I agree with you on the more subtle colors even though I seem to always go for the brights. Scrumptious, Maria! Love how you made that giant list page. Love the flap. Nice work! what great pages in your planner. they are so bright and cheerful. I especially love the piece under the bag with the bright pink over the yellow. these are great stencils and I would love to have them all as I can't pick a favorite. thanks for the opportunity to when them. Your gelli prints using this stencil are awesome - the colors just pop! They remind me of batik. Very neat pages and I like how they all turned out, ripe with possibilities. This has been a fun blog hop. Thanks for sharing all the ways that you use a stencil. I learned some new tricks today. Those Gelli Plate prints are SO beautiful! Love them! 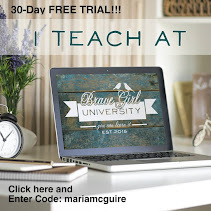 I'm enjoying this blog hop and learning along the way. Everyone's approach is so different, as are the styles, colors and substrates. Yet everything created with Traci's stencils has been awesome. So glad to see someone use the BEFREE stencil too. This blog hop has been great fun, with tons and tons of learning along the way. Can't wait to try the techniques. Your gelli prints are really gorgeous! Love that you used BEFREE. Thank you! Your gelli prints are really gorgeous! Love how you used the stencils especially the scribbly circle one! Love Traci, stencils, and the gelli plate. Love how you used the stencils especially the flower circles stencil. Would love to own it. Love your DLP layout Maria! Awesome colors! I am a long time fan of Traci. So pleased to see her making gorgeous stencils!! Great journal pages! Who wouldn't want to write on them? Loved your use of the stencils.